Discussion in 'The Garage' started by Mailman, Mar 1, 2018. Looking absolutely great there, Bob. Another recent reference pic posted by member Fullcircle, showing the serpentine routing of the speedometer cable, and the turnsignal wire clip atop the fork ear. And, not sure if you found one, fork lock tumbler. They were black on the later models but may have been white on yours. geedubya, TwoManyXS1Bs and Mailman like this. So right now, all the electrical system, with the exception of the ignition is installed and wired up, ready to go. MrBultaco and Mailman like this. The early bikes didn’t have much of a system for mounting mirrors. Most advertising doesn’t show mirrors and to the best of my knowledge they came with one long stem clamp on mirror on the left side. 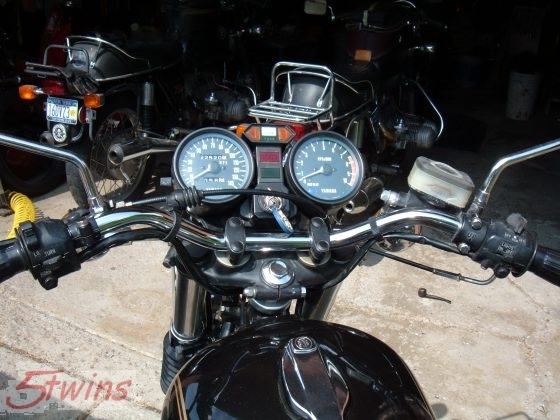 Well, my new right side master cylinder / brake lever , has a 10mm right hand threaded hole built in to accept a mirror, and I also wanted a matching mirror on the left side, so I bought these on eBay. They are small and discreet and inexpensive, and now that I have two right hand threaded 10mm mounting holes, I’m not limited to Yamaha mirrors. I bought a set of round chrome early Honda mirrors with 10” stalks, which I will install later. WHO YOU CALLIN A DIPSTICK?! Now seemed like a good time to address setting the correct level on my XS2 dipstick. As per this service bulletin. I removed the dipstick from my ‘77 650 for comparison and laid them side by side on my bench. They are exactly the same length , but clearly marked differently. The XS2 was marked to hold more oil. Here’s some detail shots of the difference. Here I’ve scribed a new oil level line on my XS2 dipstick. While I had them both on the bench it was a good time to freshen up the no good gaskets that each of them had. Alright, I had a good productive day. I’ll have to hang on to these good feelings for a few days. I’ve got a couple doctor appointments in the first part of the week. YamadudeXS650C, geedubya, MaxPete and 4 others like this. MaxPete, TwoManyXS1Bs and Mailman like this. Jim and Mailman like this. I hope you get some sleep tonight...tomorrow I bet you will hook up a battery to see if everything works. YamadudeXS650C, geedubya, GLJ and 2 others like this. Another week or so it may be running. Wish I still had the key for the lock on my 1972 I'd ship it for cost of shipping to Mailman. Then again I probably spent over $20.00 in labor time trying to pick the lock on the frame with out any luck. Probably should just bite the bullet and take the cut-off wheel to the frame then I could chuck the piece in the lathe and machine away till it falls out. I'm just afraid if it did that the next day someone would post that they are in need of a bare frame for a 1972! Mailman, Jim and TwoManyXS1Bs like this. Very nice Bob - really pretty! May I ask, where did you get the gaskets for the dipsticks? I’m sure there’s more I haven’t thought of. 59Tebo, Wulfbyte and Jim like this. Thanks Pete! I’m sure I ordered them from Mikes. New side cover emblems? Where did you get them? Pics. I ordered the chrome scallops from an eBay seller, now not available. Couldn’t find anymore on eBay. I bought the 650 emblems from Marble Motors when I had them do my paint. They still have everything. They’re VERY expensive , all new and they look great. I’ll try and get you some photos tomorrow. Meantime have a look here. TwoManyXS1Bs, GLJ and Jim like this. WOW they do look nice. Don't you ever park that bike on my block . Haha! I keep trying to convince my wife , that it would look really nice in the living room. MrBultaco, YamadudeXS650C, Jim and 2 others like this. I think you are right. You don't want to get a bunch of desert sand and grit on that thing. GLJ, Mailman and Jim like this. ...your bike seems to be your love, I just your hobby? Superjet, Meddy, GLJ and 2 others like this. I have the place in the basement livingroom picked out already. Wife knows she will lose this battle but keeps trying. Superjet, GLJ, YamadudeXS650C and 2 others like this.